October 23, 2017 - No Comments! 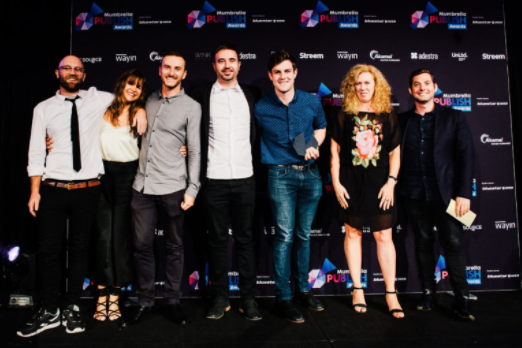 Our newest and cheekiest title, Punkee, was last Thursday named the ‘Launch of The Year - Big Publisher’ at Mumbrella’s Publish Awards. Punkee beat stiff competition from major publishers including Domain, 9Honey, Medium Rare, News Corp and Pacific Magazines to take the coveted title. In just 5 months since launch, Punkee has had over 1.8 million Australian sessions and 13 million video views, with over 142K highly engaged Facebook followers. Punkee is a mobile and social media-led entertainment platform launched in June aimed at Gen Z Australians. The cheekier younger sister of pop-culture title Junkee, Punkee takes an original tongue-in- cheek look at life’s guilty pleasures, including internet culture, memes, music, celebrities, TV, humour, gaming and movies all aimed at 15 to 22 year-old Australians. Punkee is quickly gaining a cult following for its recaps of TV shows like The Bachelor and The Bachelorette, with over 12 million minutes spent watching the social recaps in the past three months. In addition to the huge social impact of Punkee, its launch also reached millions of people through oOh!media’s digital network, and its content is amplified across Locate by oOh! Study network, which reaches over 1.3 million students each week across 106 tertiary campuses nationally. Punkee is headed up by Managing Editor Tom Pitney who joined Junkee Media last year when it purchased TheVine where he was owner and publisher. Punkee has a unique forward-thinking publishing model that focuses on off-platform mobile audiences, and uses original vertical video format in digital and out-of-home environments. Punkee’s brand partners in the first 4 months have included brands like Fanta, Disney, Swinburne University, 20th Century Fox, Sony Pictures and Sony Playstation, with ‘native memes' for Disney, and a sold out Punkee movie screening of Cars 3 at a drive-through cinema in Melbourne being some early highlights. “We are thrilled with the impact Punkee has had in just a few months,” said Junkee Media CEO Neil Ackland. “It’s quickly becoming a household name amongst Gen Z’s. Before launching, we conducted a huge research study into Gen Z’s to help guide our thinking on Punkee and the insights we gained from that have really paid off. There’s really nothing else like Punkee out there and it shows how original ideas and thinking really cuts through in a crowded media landscape”.